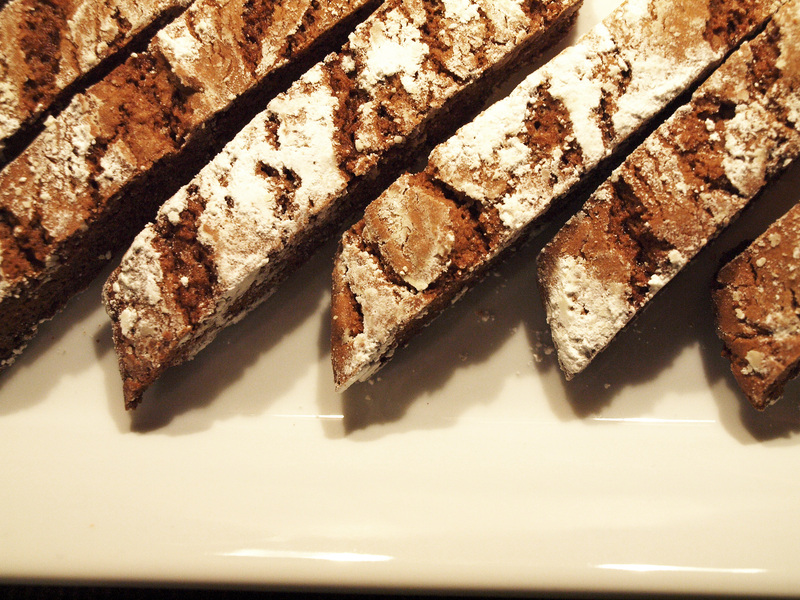 Gingerbread Biscotti is a wonderful holiday treat with coffee, tea, hot chocolate, or even cold milk. The traditional flavor of gingerbread meets the crunchiness of biscotti in an easy to make and beautiful package. I have made this several times already this winter, for potlucks, gifts, and of course for myself! I found this recipe on Pinterest, courtesy of She Wears Many Hats. 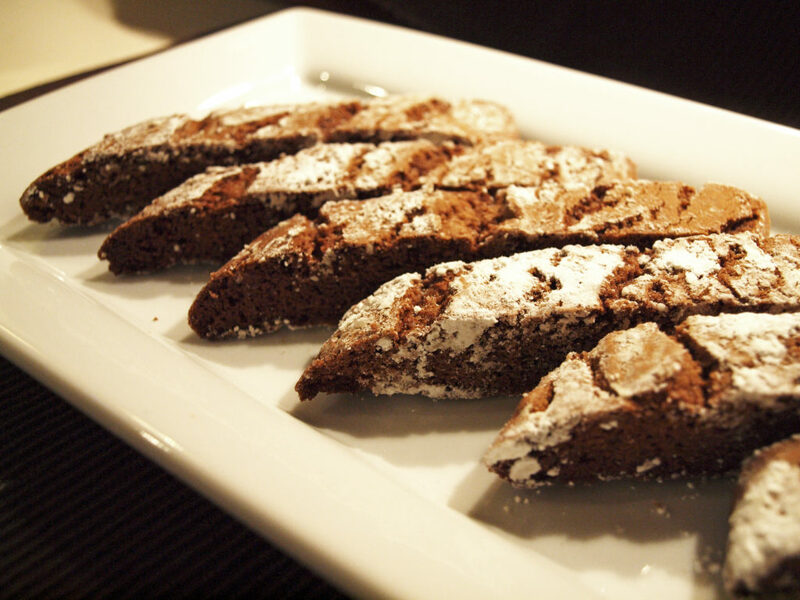 Gingerbread Biscotti are very crunchy, but turn nice and soft after just a couple of seconds dipped in the beverage of your choice. They look beautiful with the powdered sugar and make great gifts. Biscotti are great year-round, so you don’t have to limit this flavor just to Christmas. The spices are especially nice and warming when it’s crazy cold outside. Here in Indiana we are dealing with some terribly cold and icy weather and I know a lot of other places are too – why not stay home and bake? When things thaw out you’ll have a pantry full of goodies to share. If you need ideas for packaging, you can find cute little boxes and plastic bags for food gifts at craft stores. Want a variety of biscotti? Try out Walnut Biscotti (on my old site, haven’t moved it over yet) too! There are lots of photos there for a step by step walk through of the process. Preheat oven to 350 degrees. Prepare large cookie sheet by lining with parchment, baking mat, or with butter and flour. In a medium bowl, mix together flour, baking soda, salt, cinnamon, ginger, allspice, cloves and pepper. Set aside. In a large bowl, use an electric mixer to cream together the butter and brown sugar about 2 minutes on medium-high until combined. Add eggs and beat until combined well. Stir in vanilla and molasses; combine well. Stir in flour mixture to form a stiff dough. Divide dough in half. Flour hands (to keep from being sticky) and form dough into two slightly flattened logs, laying the long way on the prepared cookie sheet, each approximately 12 inches long and 2 inches wide. These will spread out quite a bit so give them space. Spread powdered sugar over the top. Don't be skimpy on this, it's what makes the tops pretty. Bake 30 minutes, or until slightly firm to the touch. Leave the oven on. Cool on baking sheet 5-10 minutes until you can touch it without it being too hot. Transfer to cutting board and cut into 3/4 inch slices. Arrange biscotti, cut sides down, on cookie sheet and bake for 10 minutes. Take the pan out, flip each biscotti over (I recommend using a pair of chopsticks for this), and back into the oven for another 10-12 minutes. Enjoy with hot chocolate, cold milk, coffee, or hot tea. Store in airtight containers up to 1 week. Biscotti may be kept wrapped in freezer safe plastic wrap and frozen up to a month. This entry was posted in Desserts and tagged dessert, fall, Italian, winter.